The tomb of Princes has a very plain external view and located nearby the tomb of Sultan Murat II. The structure has a big dome, brick covered floor and limestone covered walls. It seems octagonal from outside but quadrilateral from inside. Entrance of the structure is very well decorated with interlocking wooden laths in geometrical shapes. All interior walls are decorated with plant motifs, hand drawn ornaments, ribbons and flowers in baskets. 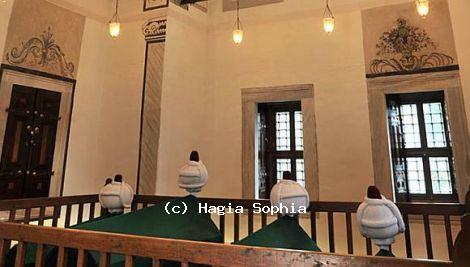 In the tomb of Princes 4 princes and the daughter of Sultan Murat III are buried.